Luxury homes at the $1.4-billion Royal Atlantis Resort & Residences, set to become Dubai’s first super-prime development, are now on the market. 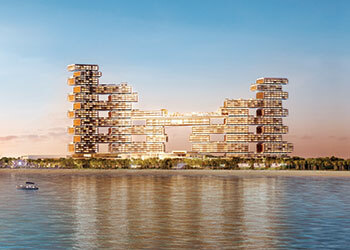 Sales of Dubai’s first super-prime residences have been launched by Kerzner International in collaboration with Knight Frank at The Royal Atlantis Resort and Residences, adjacent to iconic Atlantis, The Palm resort. Located on the crescent of The Palm Jumeirah, the project is owned by Investment Corporation of Dubai and managed by Kerzner International, a leading developer and operator of destination resorts and luxury hotels. The 43-storey project is being built at a cost of $1.4 billion and is due for completion in 2018, according to reports. When completed, the development will offer 231 residences and 795 new lavish guest rooms and suites over 10 hectares of land. 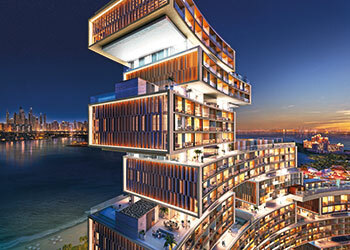 “We are incredibly proud to launch The Royal Atlantis Residences in Dubai. Building on the success of Atlantis, The Palm, this next phase of Atlantis, including the luxury residences of The Royal Atlantis, will continue to drive the growth of Dubai forward,” remarks Issam Galadari, the director, The Royal Atlantis Resort & Residences. “The development will become the new landmark of Dubai and will support the ‘Dubai Plan 2021’ in positioning it as one of the best places to live in the world,” he states. A team of international experts have come together to create the newest icon in Dubai, including award-winning architects – KPF Associates; residential interior designer - Sybille de Margerie; water feature creators – WET; and sky pool and lounge designer – David Mexico. With prices starting at Dh7.6 million ($2 million), The Royal Atlantis Residences will boast of contemporary living spaces with uninterrupted views of the ocean or across the waters of The Palm towards the Dubai city skyline. This project will not only be best-in-class for Dubai but will certainly be one of the best projects globally,” she adds.